Note: This document is not designed to replace the product manual from the manufacturer. The information is provided as is based on our knowledge of the model FI8910W. It may not be accurate or up-to-date. In general, users shall contact the manufacturer for technical support. Foscam FI8910W is a wired/wireless PTZ network camera that supports 640x480 image / video resolution. It can upload image snapshots at no more than 1 image/s. This model does not directly support video/audio recording. You can use CameraFTP VSS on a PC connecting to the camera's video stream. VSS can upload true video/audio to the cloud. Turn on the camera and connectwith a network router using an Ethernet cable. 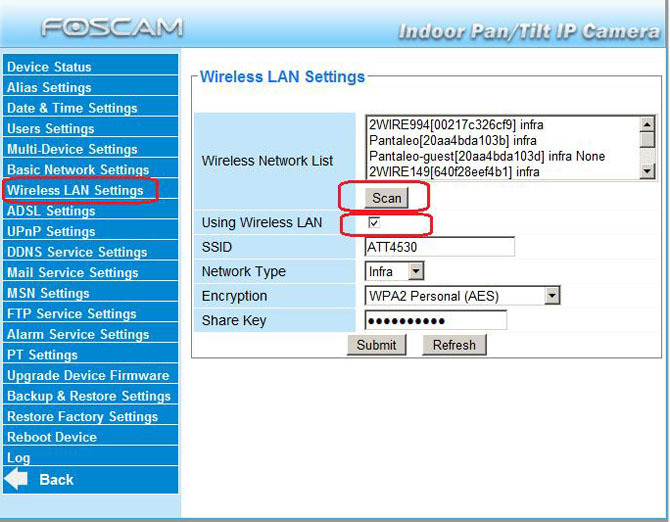 The tool automatically detects Foscam cameras in the same network. If it finds a camera, it will be displayed in the above screen. Open a web browser (IE is recommended) and access the Camera’s configuration page at: (Please replace the IP address with the real IP address found using the IP Camera Tool). Click “ActiveX Mode”, it will ask you to install an ActiveX control. Please make sure you install the ActiveX control. You can select the image resolution on the left-hand side. Please make sure it matches your CameraFTP subscription. From the previous screen, click on “Device Management” (at the bottom-left corner). This will open the main configuration window. Click on Scan to display a list of wireless networks. Select the correct wireless router, then enter the security credentials, please also make sure you check the “Checkbox” - Using Wireless LAN. Your camera will be connected to your wireless network. Check the checkbox “Upload image on Alarm”. Select an upload interval that matches your CameraFTP subscription (or planned subscription). For example, if your subscription allows a max upload frequency of 1 image / 2 seconds, then select the “upload interval” to 2 seconds. Entering an incorrect number may get your account blocked. Note: Some new Foscam camera models may have a different interface like the following, in this case, you need to enter the FTP Server URL as shown in the screenshot. If you check the checkbox, then the camera will keep uploading images to CameraFTP server. It will use more storage space and bandwidth. It may also slow down your Internet connection. Upload interval : enter a valid number that matches your CameraFTP subscription (or planned subscription). If it is successful, congratulations, you are done! You can then remove the Ethernet cable. If you need to make changes, you can run the “IP Camera Tool” again to find the camera’s IP address (as it may change), and then access the camera’s configuration page.